“It’s important that both you and your spouse understand the investments that you have chosen”. I stared at this sentence, and felt like a hypocrite. I had shared a financial book with a friend who was desperate to control her spending and pay down her debt. After she returned the book, I flipped through the pages, and it was the sentence above that jumped off the page. I knew very little about the investments that my husband had chosen for us, but what was wrong with that? I trusted him and he trusted our bank, as they are passionate about serving the military. Certainly our bank would have our best interests in mind! I am not good with math, investments have numbers, and therefore I’d make horrible decisions, costing us our life savings. And what did all of these abbreviations mean? TSA or TSP? Traditional IRA or Roth IRA? 401(k) or was it 403(b)? I didn’t have the time to figure this out! My husband was deployed and I had four kids running around! Feeling convicted, I checked out “Investments for Dummies”, and I quickly realized that my husband, bless his trusting heart, had followed our bank’s advice, which cost us more money than I care to calculate. The more I read and researched, however, the more my disappointment was replaced with excitement as I began to understand the “investment language” that I had avoided for years. 1. No one cares about your money as much as you do! I cannot emphasize this enough. If you are going to invest your hard earned money, please learn about where it is going! Just knowing how much it will cost to own one mutual fund versus another can save you thousands of dollars!”Investing For Dummies” by Eric Tyson and “The Road To Wealth” by Suze Orman are great resources for money management and investment decisions. 2. Do not make financial decisions while talking on a satellite phone in the Iraqi desert! We learned this lesson the hard way. Don’t get talked into investing your money in a fund that you haven’t had time to research. Ask that the fund’s information be sent to you, and then research the fund on Morningstar or Yahoo Finance. How does this fund compare to others in terms of their management fees? How much money has the fund made not just this year, but since it was founded? 3. Take advantage of your TSP. People may debate this, but for the average person who doesn’t want to actively manage their retirement money, the TSP is an awesome option. The sooner you start taking advantage of your TSP, the better. Let’s say at age 25, you start putting $100 a month into a TSP that returns on average 10% a year. 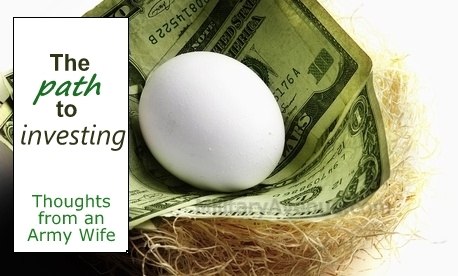 When you turn 65, you’ve got a $630,000 nest egg waiting for you! What if you wait until you’re 35 to start investing $100 a month? Those ten years will cost you $400,000, giving you a nest egg that’s only worth $230,000. Yikes! 4. Get to Know Your Friendly Roth IRA. A Roth IRA is an awesome way to save for retirement. Determine your financial goals, pick a fund from a company such as Vanguard or Fidelity, chose automatic contributions, and let it ride until it’s time to sail off into the retirement sunset. My husband and I are finally on a productive investment track, and it’s exciting to see our hard work and research paying off. While it’s hard to comprehend, there will come a day where we will jump off the PCS merry-go-round and have time to enjoy the fruits of our labor. I hope this article will help you get started so that one day you may do the same! Amy Bashaw - https://twitter.com/militaryfam - "Army wife to one and Mom to many. Blessed beyond measure." Thank you so much for allowing me to share! What an awesome opportunity to share something that I'm passionate about! If you have any questions or comments, feel free to leave them here and I'll get back with you just as soon as I can. I have a trusty partner in crime who's in the Army, has his MBA, and carries around a tremendous heart for military families and their financials. Between the two of us, we'll get you pointed in the right direction. Thank you again, Amy, for being a guest at 'Our Letters to You' I love it when military spouses work to empower other military-family members! Thank you for the invitation! It was my pleasure. Your comments about being honest and then being responsible hit the nail on the head. You can ignore investing in your financial future for just so long. Then, hits the reality that the future is now. You're young and wise. Indeed, financial planning and investing are complicated, comes with a steep learning curve, and is also time consuming. Yet, your wise point again is dead on: who cares and will take better care of your future than you. You and your man are well ahead of the game. Thanks for sharing. I enjoyed your honesty, sense of personal responsibility, and caring to inform others. Can I borrow your "Investments for Dummies" book? Thank you very much for the kind words. What an encouragement! You can borrow my book and I may be able to share my Kindle copy. I believe I can locate your address fairly easily. If I have any trouble, I will let you know. PCS? Moving Tools Can Make it Easier! How do you organize your family calendar?